My Dad's has a bike that we used to go around. 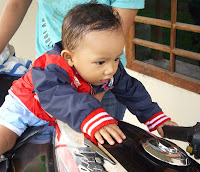 For me, it is too big to ride.. but I always wanna try to ride it..It is always fun when my Dad's and Mom's took me along with that bike.... I can feel the wind, and fresh air (of course if there is no other big vehicle in front),,, Seeing the road and the environtment along the ride will be very pleasure experience while you are at my age. I always laughs,,,even I enjoy it... My Dad always tell me that laugh is a better medicine,,,so if I laughs,,I've got a better medicine.. It will strenght my heart, and give me a fresh simulation in my body.. Well,, I lauhghs louder and fell free for my self,, after all I am just a little baby.. This is My Diary Site designed by Yola.com for me for free I can add all the text by my own text. This blog tells about me, my mom and dad as well as my big happy family. In here you will find all the information about me,,,, yeahh,,, it's about me, where I was born, my meal, my activities and so on. Thanks to my Dad that help me to customize the blog and be my personal assistant to write the blog,,, he,, he,,he,,, my Dad love to do this for me....;) . I am actually near two years old (by the time I using this blog), and haven't completed my all teeth grown. 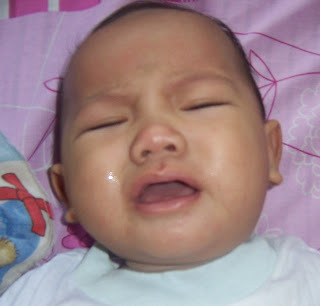 I was born in Pontianak, West Kalimantan, Indonesia, September 12, 2006.